On his epic voyage homeward from Troy to Ithaca, Odysseus, the hero of Homer’s Odyssey, had his crew bind him to the mast of his ship to keep him from being lured away by the enchanting sound of the Siren’s song. The crew stuffed their own ears with beeswax, to cut out not only the music of the Siren but also their captain’s delirious orders for them to set him free. My own mundane journeys homeward in search of traces “my” vanished (or imagined) New York include a ritual of recurring late-day walks from Brighton Beach, past Coney Island, and on to Seagate and back, sometimes over the sand but usually on the part-wood, part-concrete surface of the historic boardwalk. Unlike Odysseus and his crew, I do not fear the songs of local Sirens. I traverse my route with ears unfilled and feet unfettered. Among the rewards: A pastiche of overheard conversations in Russian, Yiddish, Spanish, Haitian Creole-French, and even English, these inter-cut with melodies and rhythms of live and recorded music: Salsa, Hip-hop, Afro-Caribbean, and mid-20th-century Soviet pop and post-Soviet Russian Rap. The music, in turn, brings with it occasional chances to join in summer-evening dance events, organized and impromptu. A few weeks ago, a new Siren’s song led me from the boardwalk, across the windswept beach, and into the cold surf of Lower New York Bay. What had first caught my ear was a distant Serbian-Roma brass-band sound not unlike that of Goran Bregovich that then seemed to merge with the tightly-arranged, turn-of-the-20th-century military marches of John Philip Sousa and then take on a hip-hop beat. Turning seaward towards the source of the music, I saw the blinding glint of late-day sun rays bouncing off the polished brass bells of two Sousaphones. 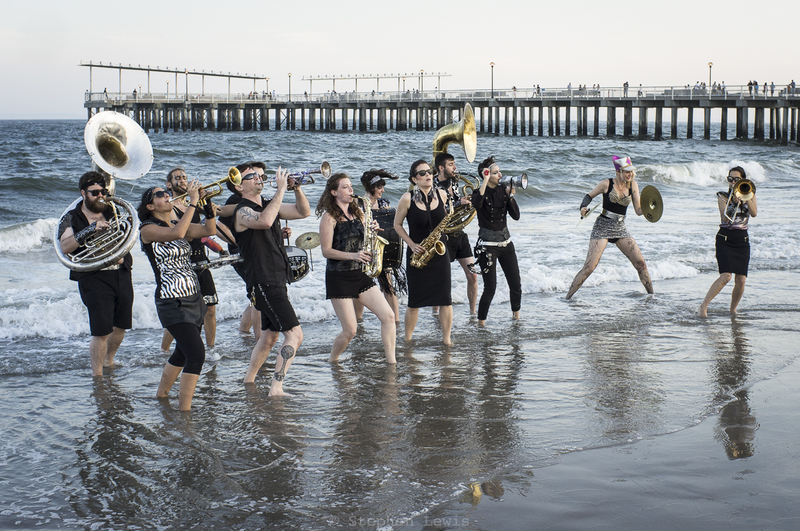 There, standing in the surf, was a dozen-person-strong brass orchestra, its members attired as monochrome gladiators or, with a flight of fantasy, as Odysseus and his crew. 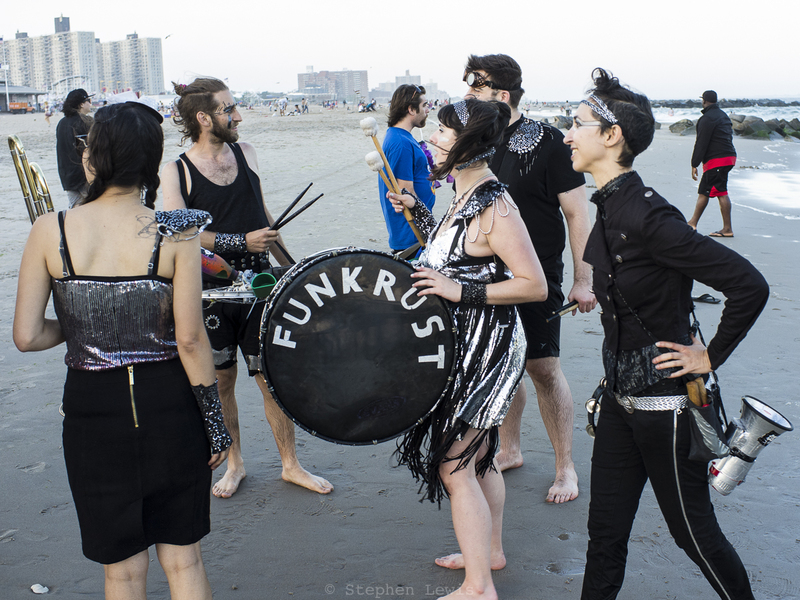 The name of the band: Funkrust. I hope to hear — and see — them again. Over the past three years, betwixt and between,I’ve been delving into the housing policies and achievements of “Red Vienna” (i.e. the visionary, socialist-dominated municipality of Vienna from 1919-1934) and its legacies, physical and social. So far, my method has been two-fold: On a number of extended stays in Vienna, I’ve systematically walked the streets of the city from core to periphery, stopping at the great Gemeindebau (municipal housing estates) of the period. I’ve also explored relevant literature; amongst my primary guides: Architectural historian Eve Blau’s masterful The Architecture of Red Vienna (MIT Press, 1999). Between the end of the First World War and the right-wing, fascist coup d’état that brought down the legitimate government of Austria in 1934, the left-wing “red” government of the municipality of Vienna managed to do what few cities have done before or since. In only fifteen years, Vienna built scores of housing complexes providing a total of more than 65,000 new apartment units — affordable, modern, appealing dwellings for a total of more a quarter of a million people— and this in the face of a massive housing shortage, a legacy supply of substandard housing, minimal available green- or brown-space, a declining tax base, and severe economic deprivation stemming from the post-WWI dismemberment of the Austro-Hungarian Empire and compounded by the worldwide great economic depression. To put this in perspective, imagine the city of New York, which today has a population four times greater than that of Vienna during the 1920s (more than 8,000,000 people in NYC today vs. almost 2,000,000 in Vienna at the end of WWI), having built more than 250,000 new apartments for more than a million of its residents in the space of only a decade-and-a-half — and this not even during well-heeled times a la the Bloomberg and de Blasio years, but, say, during the great depression of the 1930s or the municipal bankruptcy era of the 1970s. The housing complexes and ancillary social infrastructure of “Red Vienna” provided people with more than just shelter. Their siting, layouts, external architecture, interior design and fittings, communal facilities, shared space, and interfaces with the city-at-large were painstakingly thought out and implemented down to the smallest details to foster family life, social cohesion, and individual growth, and to craft both a new aesthetic and a better urban and socio-economic environment. Not least, in addition to the enormity of physical achievement of its housing program, the land acquisition and funding strategies involved in building projects of “Red Vienna” were brilliant exercises in public administration and finance. 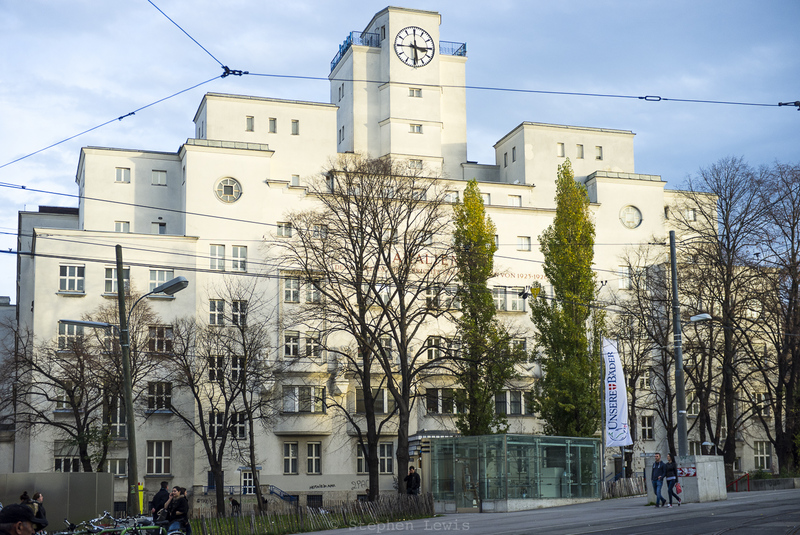 Today, almost a century later, the aesthetic and social legacies of the building programs of “Red Vienna” — anathema to the Austrian and German right-wingers and Nazis who attempted to destroy them between 1934 and 1945 — have endured to the present. 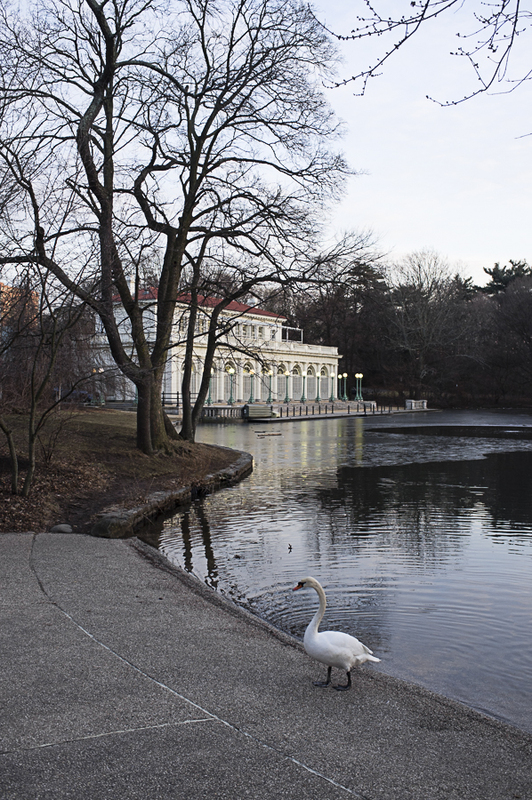 Physically, they continue to house lower-income Viennese, new immigrants primarily. Ideologically and in terms of ethos, they lay dormant, a “sleeping beauty” of sorts ready to provide any and all who are interested with ample clues and inspiration for how to deal with today’s crisis-level social and economic bifurcations and the associated lack of affordable housing that fillets the demography and eats away at the foundations of major cities worldwide. 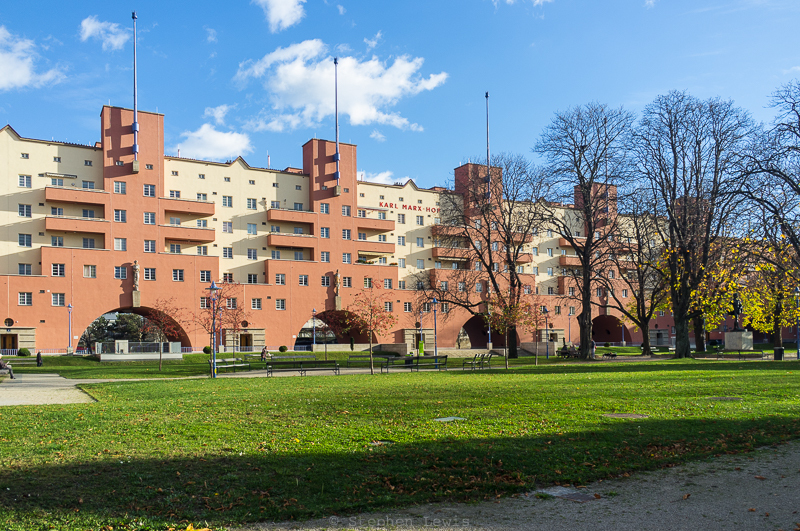 At the top: The main courtyard and emblematic arched facade of the Karl-Marx-Hof housing estate, designed by architect Karl Ehn and built between 1926 and 1930. Conceived and constructed in the form of a single, elongated structure well over a kilometer in length, the interconnected blocks of Karl-Marx-Hof snakesaround a series of open and enclosed courtyards on a plot with an area of more than 150,000 square meters. Massive archways still open the complex to pedestrian through-traffic, making it’s length a real and a symbolic gateway rather than a barrier. At its opening, the Karl-Marx-Hof contained 1,400 apartments intended for more than 5,000 inhabitants. It’s original communal laundries and bath and shower facilities yielded way over the decades to apartment-based amenities. The central area shown above was severely damaged during the fascist coup of 1934, when working-class residents of Karl-Marx-Hof rose up to defend their new home against right-wing militias. Euring the years of the Nazi period the name “Karl Marx” was (temporarily!) expunged. Immediately above: The Amalien Bath, built in the early 1920s, one of the world’s largest swimming pool and bath complexes and a gem of the social infrastructure of “Red Vienna.” Towering over Reumannplatz,a central square in the traditionally working-class 10th district of Vienna, the complex was named after a Viennese social-democratic children’s and women’s rights advocate, Amalie Pölzer. The Amalien Bath was severely damaged by aerial and artillery bombardment during the Soviet advance into Vienna in 1945 but was restored to its original appearance during the immediate post-war years. The luxury of its interior continues to give ordinary Viennese access to low-cost but luxurious swimming and spa facilities. To tourists at least, the city of Amsterdam is best known for its historic urban core of 17th- and 18th-century townhouses set along a grid of concentric and radial, tree-lined canals, and for its supposed openness and tolerance, its red-light district and easy availability of drugs. Stereotypic legends of the population of Amsterdam’s inner city are no less the stuff of guidebook hyperbole: free-spirited hippies and revolutionaries, rough-and-tumble but lovable Dutch proletarians, sardonic barflies, and Jewish market workers, cigar makers, and diamond-cutters. In reality, however, 90% of Amsterdam’s Jews were murdered during the Second World War; the inner city’s Dutch proletariat out-migrated to suburban new towns during the post-war decades; sardonic barflies yielded way to “cool” cafe-goers; and counter-cultural “Provos” of the 1960s were replaced by heroin addicts, urban “pioneers,” and, ultimately, by well-off gentrifiers. My own favorite neighborhoods of Amsterdam were far from the historic center and closer to the urban edge. Late in the 19th century, the municipality of Amsterdam began a process of urban renewal and clearance of overcrowded slums. First, new tenement neighborhoods were constructed, modern in terms of the time, and parks and green-spaces were laid out. Then, during the early decades of the twentieth century, housing estates and apartment buildings were built farther afield, many financed and constructed by cooperative movements formed on the basis of political affiliation, labor union membership, and/or religious confession. 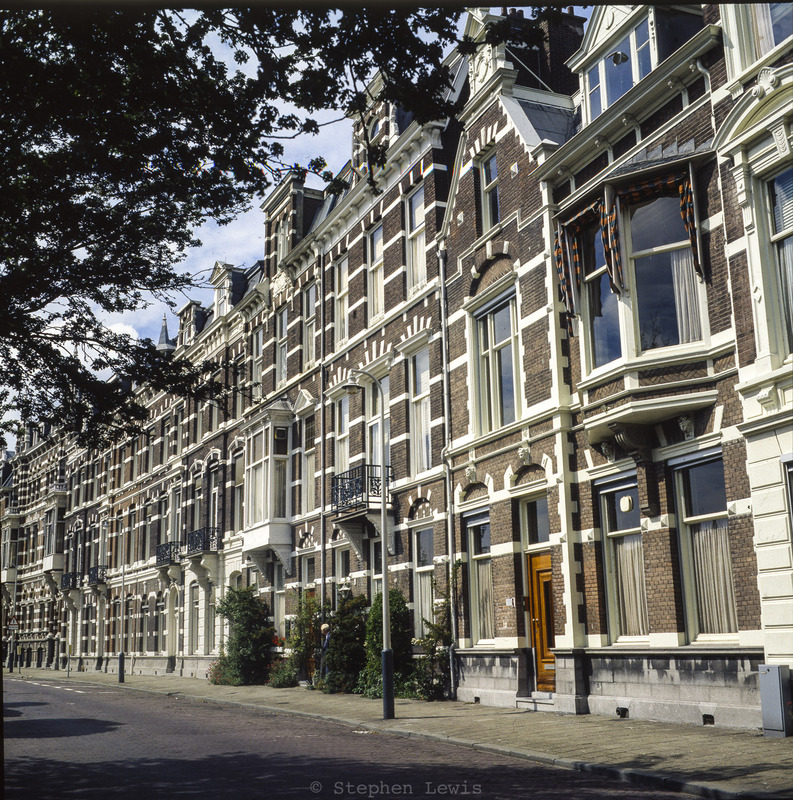 The signature architectural style of the such cooperative housing was Dutch Expressionism, aka the Amsterdam School, a style that featured rounded corners and curved lines, garden-gnome-like sculptural ornamentation, hints of Jugendstil and Bauhaus, cream-colored brick facades rather than the traditional Dutch dark-red, and windows that were tiny in comparison with those of older townhouses. The center of Amsterdam embodies nostalgia for a mythologized Dutch “Golden Age” but the apartment buildings and cooperative housing complexes of early-twentieth-century neighborhoods such as Amsterdam-South represent a forward-looking vision and a socio-political dream: a commitment to social and economic equality and the development and perfection of the individual, this animated by a spirit of cooperation, and shaped and nurtured by a built environment designed with that very purpose in mind. I wonder from afar whether today, a century after the development of Amsterdam-South and in the wake of waves of demographic change, decades of post-war prosperity, and the transformation of housing from social infrastructure to commercial commodity, anything of this ethos survives or is even remembered in the streets in which it once flourished. 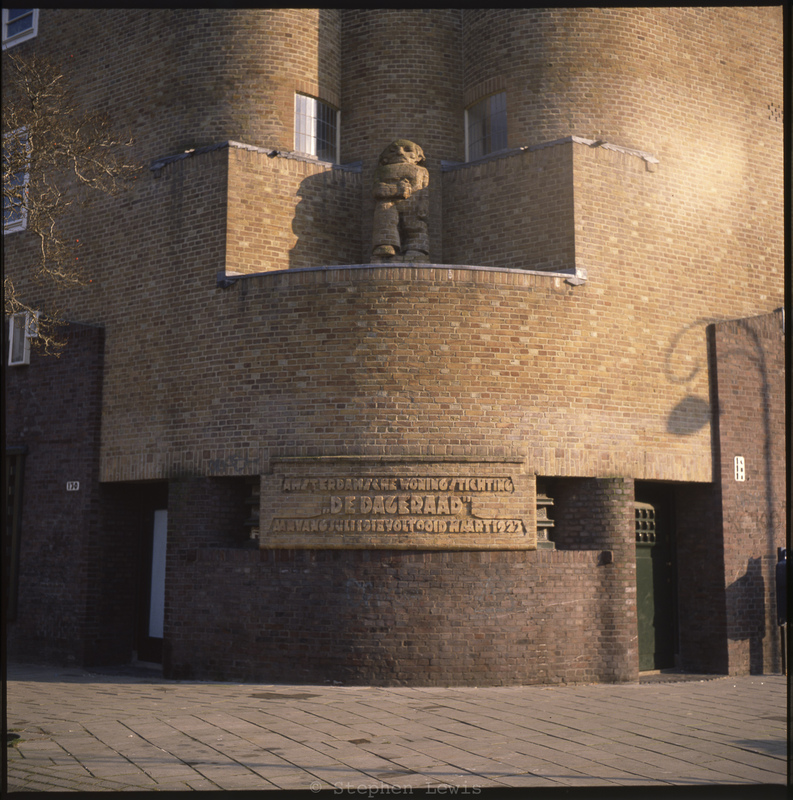 At the top of the page: the dedicatory inscription at a corner of an apartment block in the early-1920s socialist cooperative housing complex De Dageraad (The Dawn). (For excellent architectural photos of the complex, see the entry for De Dageraad in the Dutch-language Wikipedia.) Below: An early-20th-century municipal sculpture alongside the Amstel river. Both photos taken during the early-1980s on color positive film using a Rolleiflex f3.5 Tessar twin-lens reflex. In the 1970s and 1980s, the old downtown core of The Hague was in limbo. 17th- and 18th-century townhouses were neglected and underutilized, providing low-cost space for marginal and low-overhead businesses that had not yet fled to more modern, automobile-friendly quarters in newer high-rise neighborhoods and industrial terrains; fledgling restaurants geared to the cuisine and tastes of new immigrants, Turkish and Chinese mostly; “red-light”-related enterprises; drug “culture;” and dwellings up for squatting. Still, the characteristic tone of the The Hague prevailed. 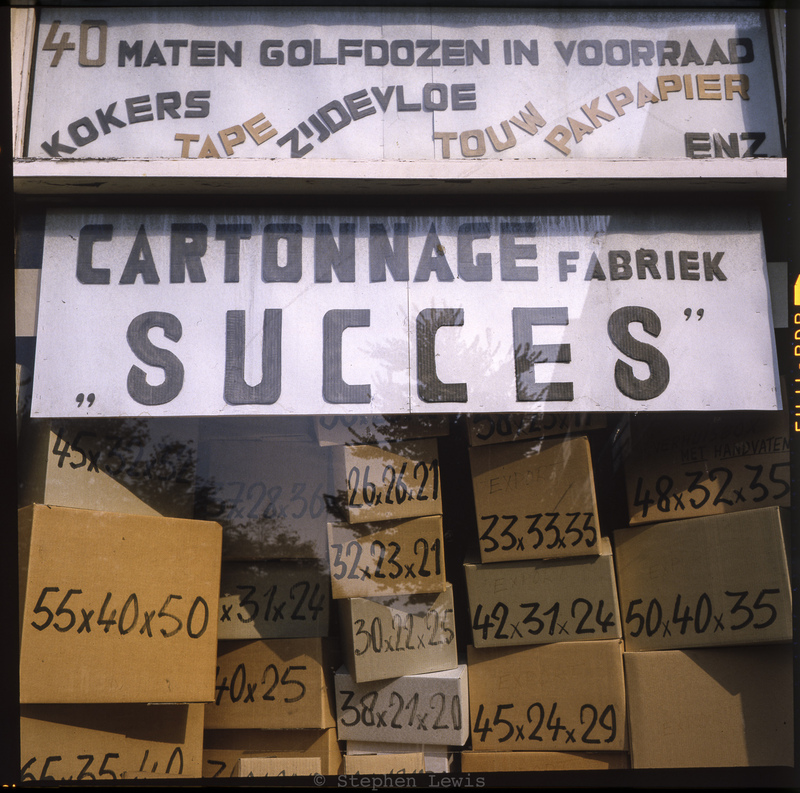 In the photo above: a stark window display embodied The Hague’s no-nonsense approach to commerce, its contents stacked precariously and its sans-serif letter-press signage true to the spareness of the city’s aesthetics. 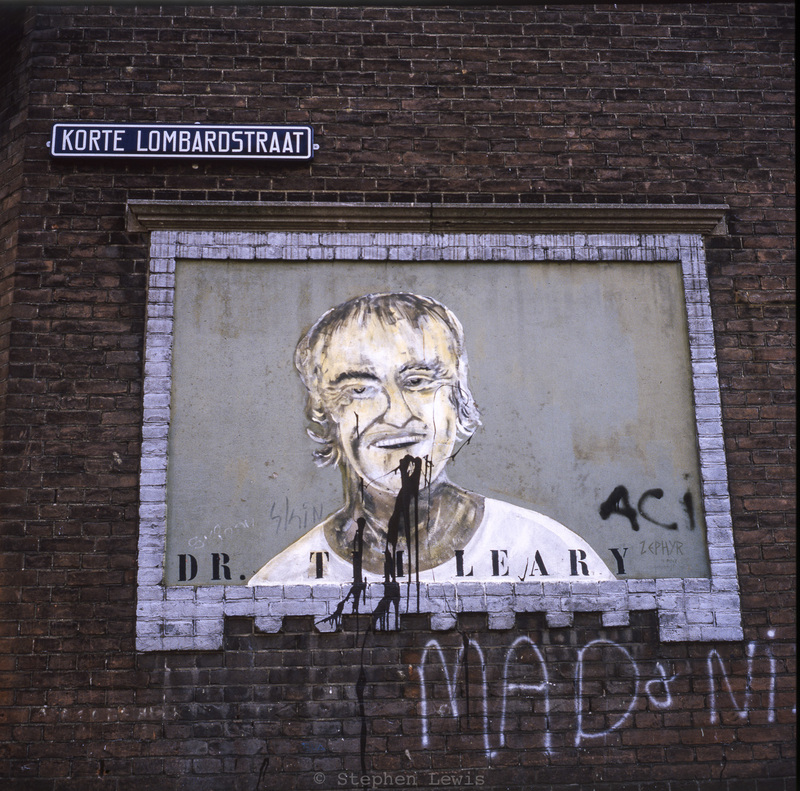 In the photo below: the wryness of the city’s understated sense of humor comes to the fore in a cartoonish, delightfully innocent-looking, street mural portrait of — of all people — American LSD guru Dr. Timothy Leary, with random defacement and senseless graffiti further augmenting its whimsicality. Both photos were taken on 120-size diapositive (slide) roll-film using a Rolleiflex f3.5 Tessar medium-format twin-lens reflex camera. S’Gravenhage, Den Haag, The Hague: Three names for a single Dutch city, the seat of government of the Kingdom of the Netherlands, set behind the sand dunes of the North Sea coast. I lived and worked in The Hague more decades ago than I care to admit to, and for long enough to have observed the city over the course of a generation. The Hague stood out from its better know neighbors, Rotterdam and Amsterdam, in its seeming ordinariness. Unlike Rotterdam, The Hague did not possess a busy deep water harbor nor exaggerated memories of hard-working stevedores, and was left relatively unscathed by bombing during World War II. 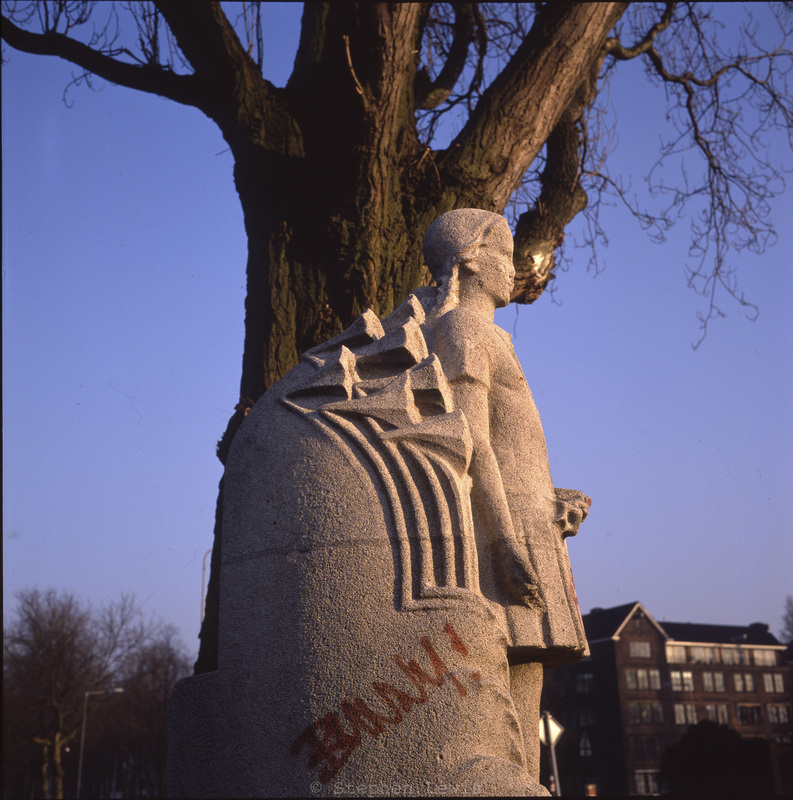 Unlike Amsterdam, The Hague was neither a commercial nor manufacturing center, nor a center of learning, nor a wellspring of labor activism and progressiveness, and it also lacked Amsterdam’s contrived, self-promoted cachet for openness and the avant-garde. In the years I knew it, The Hague was a city of government ministers and bureaucrats, high and low, of the military and of aged ex-colonials. The Hague was the base of Royal Dutch Shell and its far-flung petroleum and petrochemical empire, and of the myriad engineering firms that catered to it. It was home to a middle-class that managed its service sector and to a working class, Dutch and immigrant, that did the heavy lifting and filled repetitive entry-level jobs. On the surface at least, The Hague was outwardly conservative, staid and quiet, its streets deserted after nightfall. Socially and economically, The Hague was near-Byzantine in its stratification, its residents segmented and corralled according to finely-drawn class distinctions that defined one’s place and prerogatives: the neighborhood in which one lived, the accent with which one spoke, the way one dressed and combed one’s hair, and the education and work paths and prospects that were open to one or barred. Still, The Hague had a poetry of its own. It was a city of greenery and of parks in which the salted scent of the nearby North Sea was ever-present. In summer sunlight and the grayness of winter, the sky over The Hague seemed to hover low enough to touch. The city’s eerie near-silence in off-hours revealed subtle sounds: the occasional rhythmic slaps of shoe soles on sidewalks, the soft whoosh and rattle of bicycle tires on rain-soaked brick-paved streets, the distant metallic grind of street-car wheels against tracks, and the calls of ever-present seagulls. Calvinist city to the core, The Hague was uniform in outward appearance and minimal in its decoration. Its fashions embodied a preference for a subdued, intentionally near-dowdy, elegance. Architecturally, The Hague was a city of red brick, repetitive patterns, ornamental restraint, and subtle emblems of class — a sparseness that I’ve come to appreciate in hindsight. 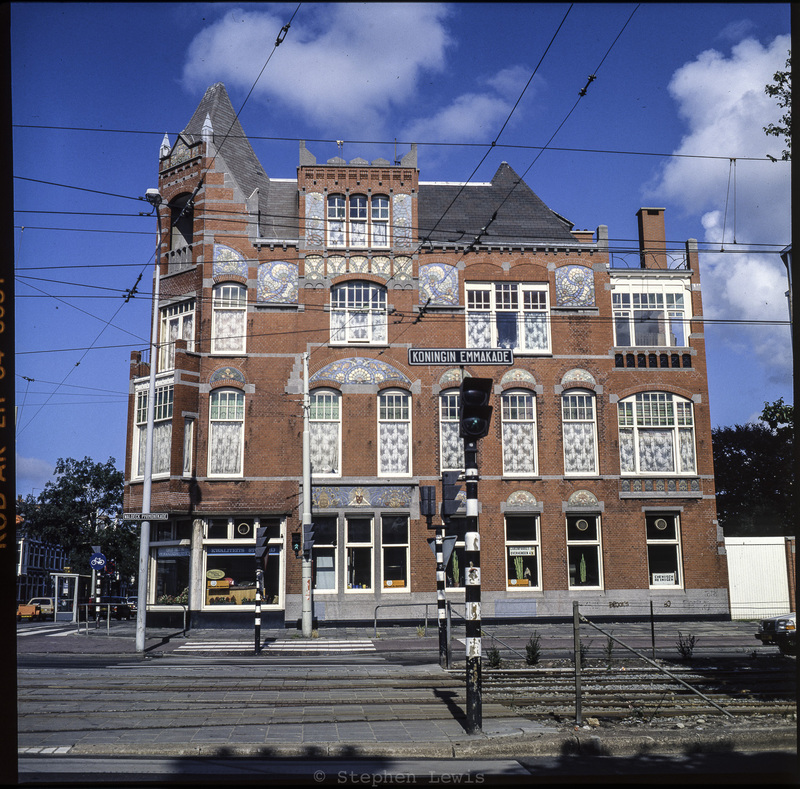 The image at the very top shows how even the defining flamboyance of turn-of-the-20th-century Art Nouveau was toned down and tamed to fit the conservatism of The Hague, and rendered subordinate to the city’s traditional red brick exteriors and Neo-Baroque gabled facades. The second image portrays a row of late-nineteenth-century town houses built for the upper-middle-class wealth, a study in uniformity and announcement of status. At the time the photo was taken, many of these buildings had been subdivided into single-story apartments or rooming houses. I assume they have been gentrified and reinstated as single-family dwellings in the decades since. 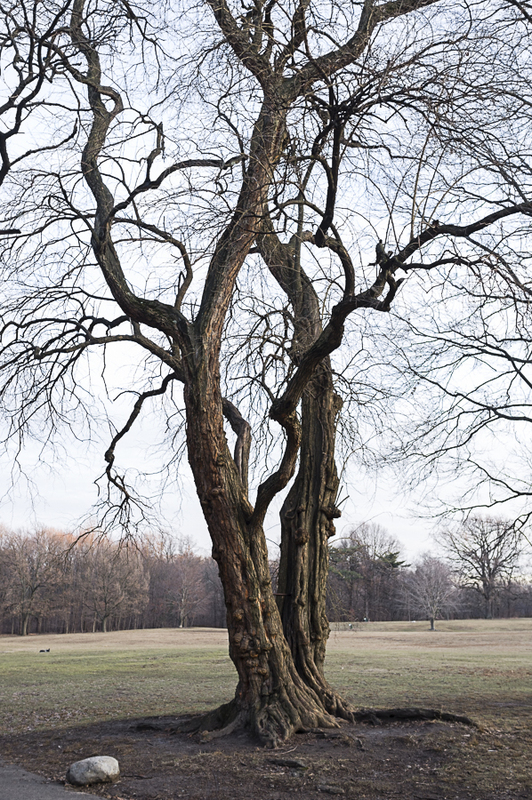 Two recollections of moments and details from spring-times past. 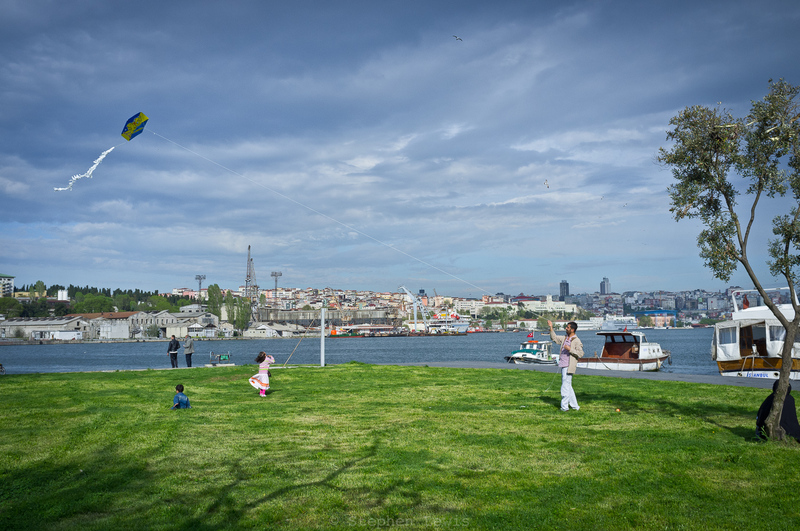 Above: A kite, a delighted child, and a patch of green on the shore of the Golden Horn near Fener, Istanbul, 2012. In the background, a shipyard and dry-dock dating from early Ottoman times. 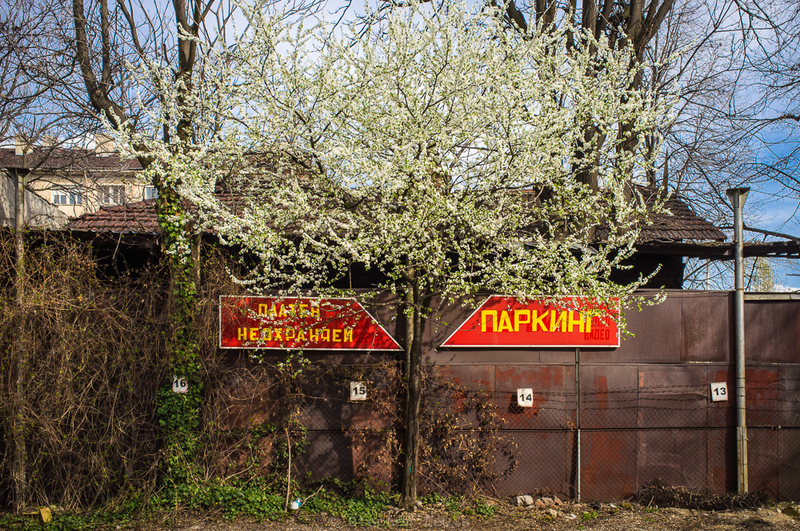 Below: Blossoms, greenery, and the weathered, roughly-welded sheet-metal wall and numbered spaces of an empty parking lot in Sofia, Bulgaria, 2014 (the straightforward text on the signs: “paid unguarded” + “parking”).